Chester arrived here on Memorial Day 2011. We’re still getting to know Chester, but he loves to be loved on, even if he does seem a little aloof at first. He is enjoying his retirement and especially loves the cookies here. 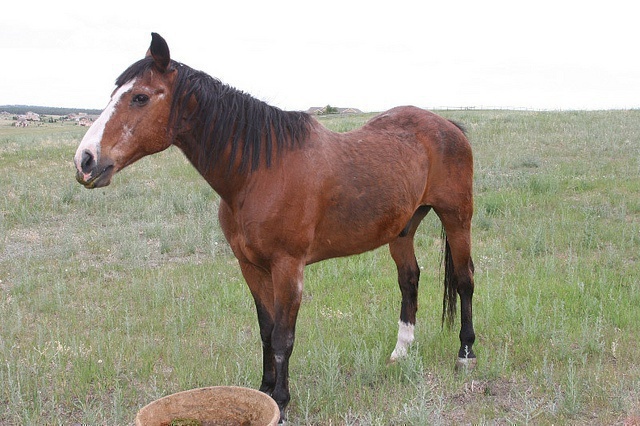 He is a 32 year old quarter horse gelding, and is currently residing in the geriatric pasture with Bull and Trixie. This group of horses, also known as the Mash Unit – Three horses that are all over 30 years old and live on ~300 lbs of mash (hay cubes, alfalfa pellets and senior feed that is mixed with water and left to get soft) a day. That is over a ton of mash a week and 100,000 pounds a year, but they are so worth it!